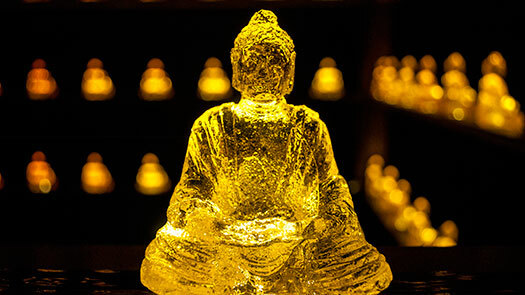 “Anicca” is comprised of Buddha figurines made of cast hard candy. The candy melts and (or) crystallizes over the course of time, changing its state of matter through a quiet process of transformation. Once installed in a space, the candy gradually reveals its fluid property, hence the objects leave the control of the artist’s hands and they are set to an autonomous performance. The idea of the installation is derived from the aesthetics of meditation. The shifting molecular structures of sugar simulate malleable membranes between self and the other. When the Buddha figurines ultimately melt all the way and turn into a formless puddle of viscous liquid, those self-obliterating objects may achieve a peaceful state of enlightenment. Yet, the materiality of hard candy generates contradictions because of its sugary sensations that are highly saturated in today’s consumer culture. The exhibition will be closed on 13 October from 12-4pm. Yuka Otani is a visual artist originally from Tokyo, Japan. She received an MFA in glass from Rhode Island School of Design and a BFA from Tama Art University. Her creative explorations focus on embracing unique characteristics of transparent materials, such as glass, hard candy, water, and light. She loves the elusiveness of the materials, and how they are poised for change. With a multi-disciplinary style of studio practice, she has been working in the crossover fields of fine art, design, and science. She has participated in a number of residency programs including Museum of Art and Design, The Studio of the Corning Museum of Glass, Pilchuck Glass School, WheatonArts, Kio-a Thau Sugar Refinery Artist Village, and Akiyoshidai International Art Village.